An extended version of my diary article published in The Sunday Life newspaper on Sunday 9th August 2015. 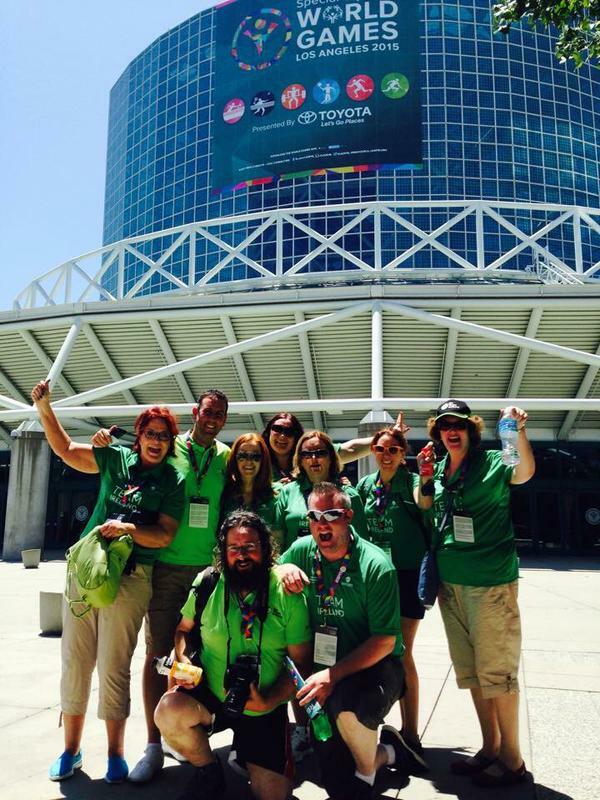 On 23rd July, 155 volunteers – myself included – flew out to Los Angeles to support Team Ireland at the 2015 Special Olympics World Summer Games (LA2015). Ten days later we returned, changed forever by our experience on the front line with our incredible Team Ireland athletes, coaches, families and fellow volunteers. Supported by a 40-strong coaching and management team, an army of volunteers and over 300 family members, 88 athletes – including 12 from Ulster – achieved incredible success. Coming home with a haul of 82 medals (26 Gold, 28 Silver and 28 Bronze), 41 Place Ribbons and 31 Personal Bests, our athletes inspired and enthralled supporters at home and abroad during their two weeks at the World Summer Games, which have been heralded as one of the most successful ever for Team Ireland. 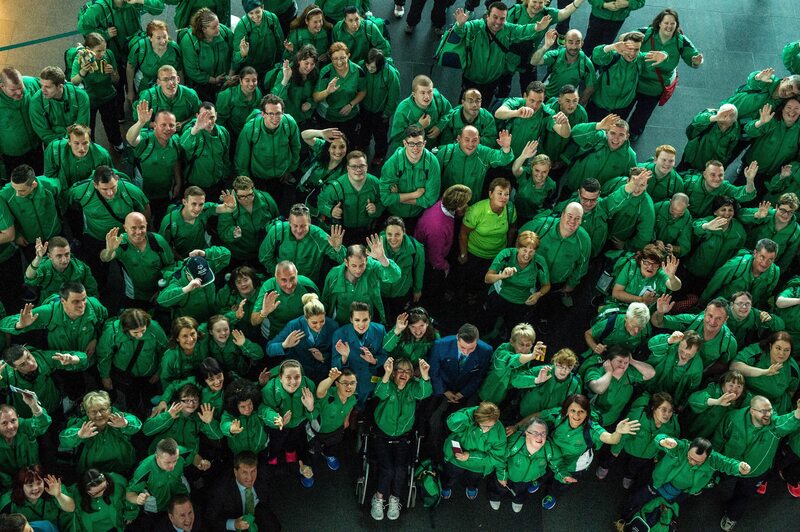 Team Ireland’s massive volunteer team was made up of 155 amazing people of all ages, from every corner of the island. You often hear the words ‘Games Makers’ when volunteer driven sports events of this kind are mentioned and LA2015 was no different. 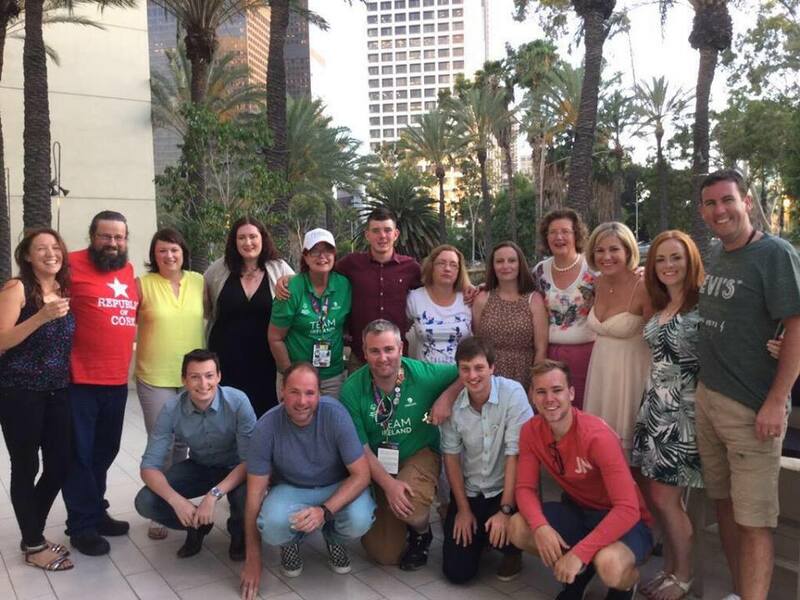 From the volunteer management and logistics team to stewarding at events and managing the presentation of Awards, Team Ireland’s volunteers really made the Special Olympics World Games in LA. My own role was in the Team Ireland Media Team or ‘The Media Mob’ as we quickly became known. The mob featured a team of 14 volunteers who are amongst the most committed and dedicated people I’ve met. 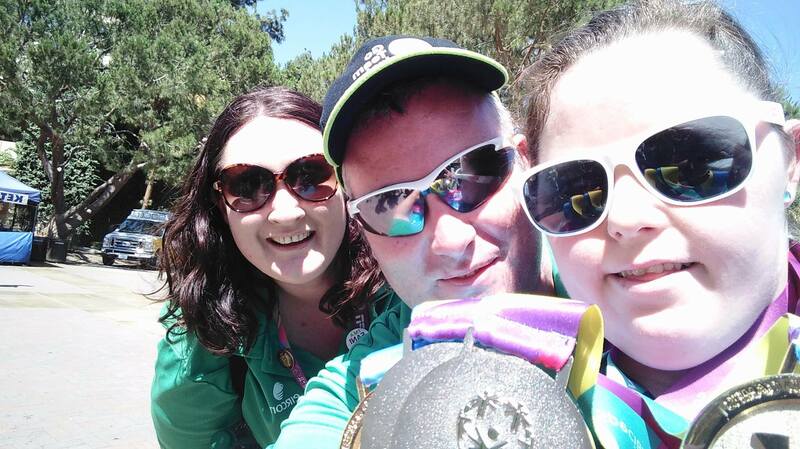 We had roving Team Ireland reporters in each competition venue that really got under the skin of the Games, seeking out and reporting incredible stories about our athletes, coaches, families and volunteers. 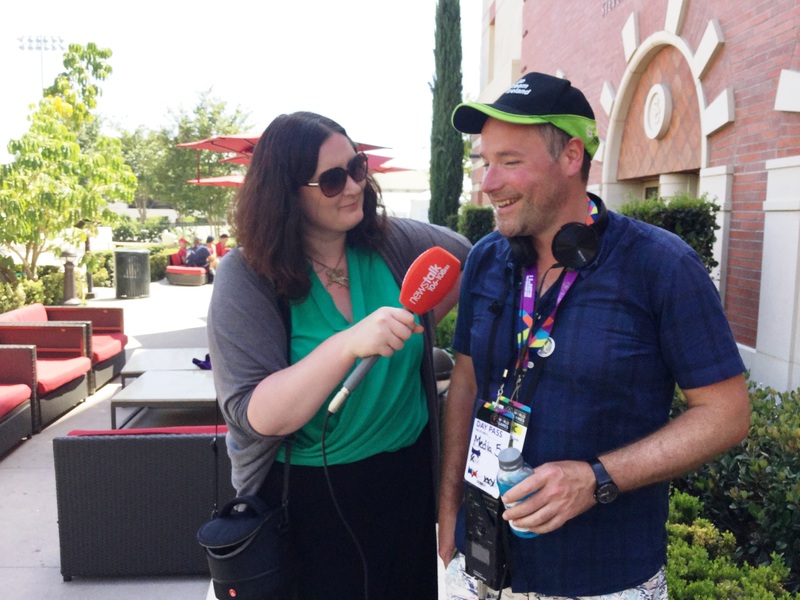 The buzz they generated on social media, the content they created and the assistance they gave to media played a vital role in getting the word out about Team Ireland at LA2015. There are too many of them to mention individually here but you will see most of them pictured above and if you follow my twitter feed – you’re bound to see an exchange or two there. Back in the media centre, we had volunteers collating Team Ireland results and tracking social media mentions, whilst I worked as part of a core team with Special Olympics Ireland’s Fiona Hynes (PR & Communications Manager) and Pamela Kavanagh (E-Marketing Manager) and Team Leader Brian O’Callaghan to distil the information down into daily press releases and social media highlights, whilst handling media enquiries. In addition to sending Team Ireland reports to media back home and responding to their queries, we also worked with traveling media, including Today FM‘s Ian Dempsey Show; RTÉ‘s Caitriona Perry; Kevin Doyle from The Irish Independent; and Newstalk’s Henry McKean. 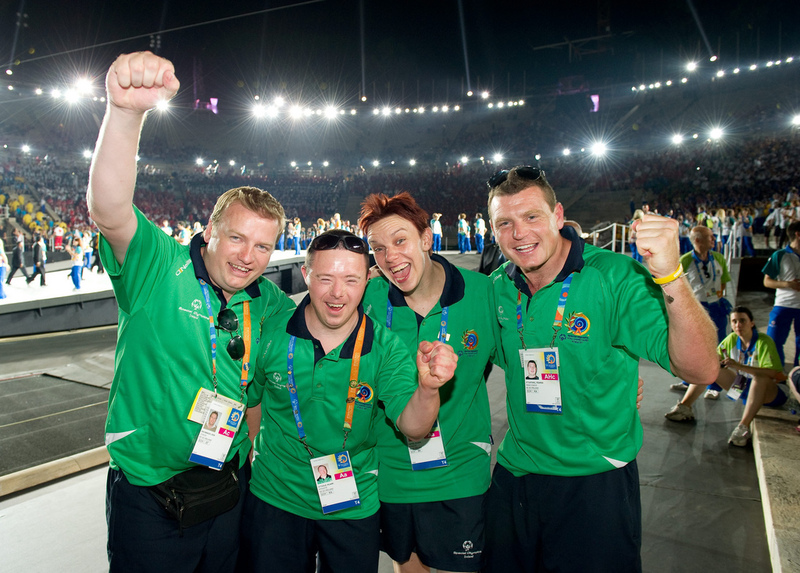 The enthusiasm and dedication they all showed to unearthing great Team Ireland stories was incredible and the daily reports they filed helped those watching, listening and reading at home feel they were truly part of the LA2015 action. Putting Newstalk’s Henry McKean through his paces. I also had the opportunity to put my old journalistic skills to good use, conducting interviews with athletes, families, Special Olympics staff and supporters, creating audio and video content for media at home. And aside from one instance – where I christened myself ‘Shaky Sinead’ whilst filming some video footage with a dose of mild heat stoke – I got through the process relatively unscathed. The time difference in LA – eight hours behind – meant there were a lot of very late nights and early mornings but the resulting coverage made it all worthwhile. Sportsfile’s Ray McManus and Paul Mohan with Kevin Doyle from The Irish Independent, keeping on the right side of the Armed Forces! As important as our daily press releases and content were, pictures and video played a vital role and were a major part of the Team Ireland output. Out on the field, day in, day out, the legend that is World Games veteran Ray McManus of Sportsfile captured so many magic moments throughout the Games – a select few of which you will see pictured in this post. His stunning photographs told the story of LA2015 so powerfully and resulted in countless front pages and amazing pictorial coverage for Team Ireland. 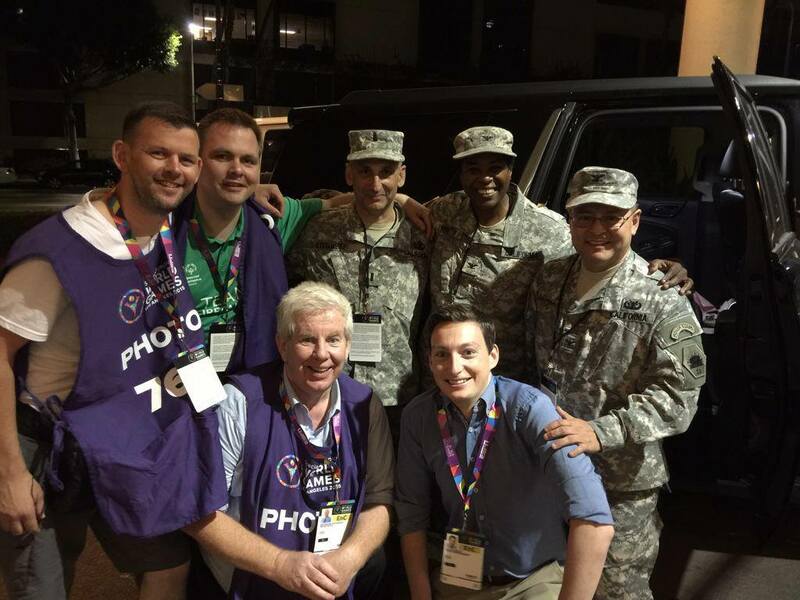 Meanwhile his colleague, Paul Mohan‘s moving videos also travelled far and wide – on television and online – delving further still into the Team Ireland LA2015 stories and capturing many special moments. A trio of well-known Irish stars joined Team Ireland for the official parade of athletes at the Opening Ceremony on Saturday 25th July 2015. John Treacy, CEO of the Irish Sports Council, who won a historic silver medal at the 1984 Olympics in Los Angeles, was joined by actor Colin Farrell, a long-time supporter of the Special Olympics movement and Claudine Keane, wife of Irish football captain, Robbie Keane (the Keanes are ambassadors for Team Ireland). Colin and Claudine showed such kindness to the athletes, spending relished time with them ahead of walking them out to a star-studded Opening Ceremony at the impressive Los Angeles Memorial Coliseum. As volunteers, we watched on proudly from the nose-bleed section of the stands, as the athletes made their way out, enjoying the great celebration that had been laid on in their honour, with performances by Stevie Wonder, Avril Lavigne and Nicole Scherzinger and a rousing address from First Lady of the United States, Michelle Obama. View the pictures here. 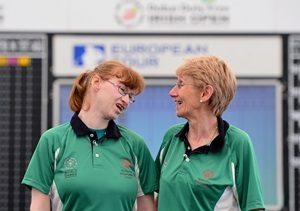 As the first day of competition got under way, Team Ireland got off to a great start, winning three medals – one Silver and two Bronze, with a host of Personal Bests achieved. The first medal of the Games was clinched by Co. Armagh swimmer, Sarah Jane Johnston, who won Bronze in the 100m backstroke. View Day One pictures here. 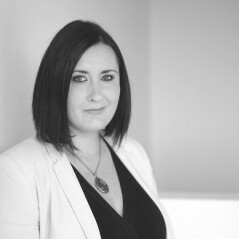 Day two of the competition saw further success in the pool for Sarah Jane Johnston (35) from Lurgan, Co Armagh. Talented Sarah Jane took home a second Bronze medal after finishing third in the 100M Freestyle, bringing Team Ireland’s medal haul to four. See the pictures here. Me and fellow Team Ireland media volunteer, Brian McGuigan from Dungiven with Belfast Team Ireland gymnast, Kirsty Devlin and her two Gold and Silver medals won at LA2015. Team Ireland’s first gold was won by 21 year old gymnast Kirsty Devlin from Belfast on day three and I was honoured to be there to see Kirsty receive her medals and meet her family afterwards. Kirsty from the Shankill in Belfast– who received a fantastic homecoming celebration last week – won an incredible total of four medals: two Gold and two Silver, as well as a fourth place ribbon in various sections of the Gymnastics Rhythmic Level 1 competition. At the end of day three, Team Ireland’s medal tally climbed to an impressive 15. Team Ireland’s winning streak continued on day four with a further seven medals won across Equestrian, Athletics and Table Tennis events. 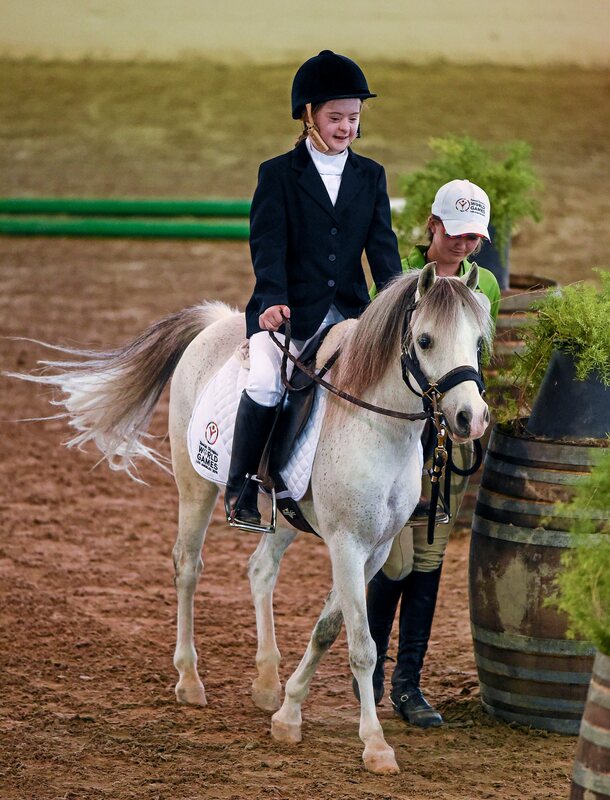 At the LA Equestrian Centre, Team Ireland enjoyed a hugely successful day with four medals captured in English Equitation over the course of the day, with a Gold won by 15-year-old Dearbhail Savage from Mowhan, Co. Armagh –Team Ireland’s youngest athlete. One of my fellow Media Team volunteers, Niamh Withers, captured an incredible video of the moment Déarbháil and her family were told she won Gold. She was being interviewed by Today FM’s Ian Dempsey at the time and the resulting reaction – alive with unscripted and unplanned emotion – was absolutely priceless. As soon I saw it, I knew Niamh had captured a magic moment. We uploaded the video on Facebook and shared it with Today FM; it went viral within hours. It remains one of my stand-out moments of the Games. Watch the video below. Being present at Mullingar Bocce athlete, Peter Malynn’s Gold medal presentation in the Los Angeles Convention Centre on day four is something I will never forget. The atmosphere was absolutely electric, with a huge crowd of Team Ireland supporters turning out to cheer him on. If you could bottle the feeling of pride and joy in the room that day – and at all of Team Ireland’s medal presentations – you’d be set for life. The Team Ireland medal rush showed no signs of slowing on day five, with a stunning 11 medals won across various sports. At the end of the day, the tally stood at a total of 33 medals. There was more success in the Ulster camp, with a double medal whammy for Special Olympics Ulster Team Ireland athletes: in Table Tennis, Newtownabbey’s Carole Catling took Gold, whilst at Long Beach, Nuala Browne from Strabane, Co. Tyrone won Silver in 500M Kayaking. View the Day Five pictures here. Me and fellow Team Ireland media volunteer Suzanne Hamilton from Bangor with NI boxing legend, Wayne McCullough. 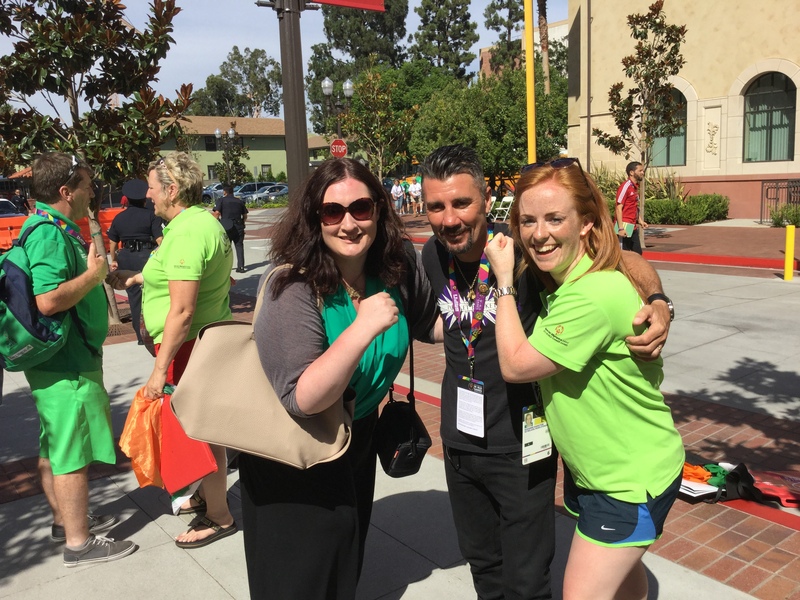 NI boxing legend, Wayne McCullough visited LA2015 on day six and I had the pleasure of taking Wayne, his wife Cheryl and daughter Wynona to see Team Ireland in competition at USC. Cheering on from the stands of Loker Stadium in the midst of a jubilant Team Ireland crowd, Wayne witnessed Dundalk athlete, James Meenan win Gold in the 100M. Christening him the ‘Junior Pocket Rocket’ after his incredible performance, Wayne was on hand to present James with his Gold medal. He then joined Team Ireland’s Acquatics team – including Co. Armagh double silver medallist Sarah Jane Johnston – to cheer on their teammate Sean Coleman from Co. Cork in the pool, as he raced to win Silver in the 25M freestyle. Giving a huge boost to Team Ireland athletes, including the 11 and 5 A Side football teams, Wayne proved a hit as he took time to pose for photos with his signature fist punch pose. On the penultimate day of the Games, Team Ireland had its best day’s performance ever, winning a staggering 37 medals in one day – more than the previous five days combined. Ulster athletes were to the fore once again. Nuala Browne from Strabane, Co. Tyrone won her second Silver in 200m Kayaking; Sean Campbell from Coleraine won Silver in Bowling Singles; Co. Armagh’s Déarbháil Savage won her second medal with a Silver in Equestrian Woking Trails; Jill Connery from Scarva, Co. Armagh secured Silver in golf (Level 2 Alternate Shot), along with her playing partner, Ursula McDonnell from Belfast, Co. Antrim; and Oliver Doherty from Buncrana, Co. Donegal also clinched Silver in Golf (18 holes). See pictures from Day Six here. On the final day of the World Games, Team Ireland’s medal haul climbed to an incredible 82, with athletes achieving a grand total of 26 Gold, 28 Silver and 28 Bronze medals; 41 Placement Ribbons and 31 individual Personal Bests. Ulster Team Ireland athletes continued to blaze a trail, with Donegal gymnast, Patrick Quinlivan winning one Silver, three Bronze and three 4th Place Ribbons; 15 year-old Co. Armagh Equestrian athlete, Déarbháil Savage brought her personal tally to three medals, helping to secure a Gold in the Equestrian Team Relay. The Team Ireland ladies basketball team put in a huge performance, beating Mexico by 19 points to 17 points to win Gold. Having seen one their high octane and truly nail-biting performances when they beat Ecuador earlier in the week, I can personally vouch that their Gold was exceptionally well deserved. View Day Seven pictures here. 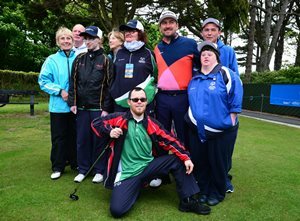 Special Olympics is a charity that needs constant investment and funding in order to continue to provide its grassroots sports and athlete development programmes in towns and cities right across the island of Ireland. 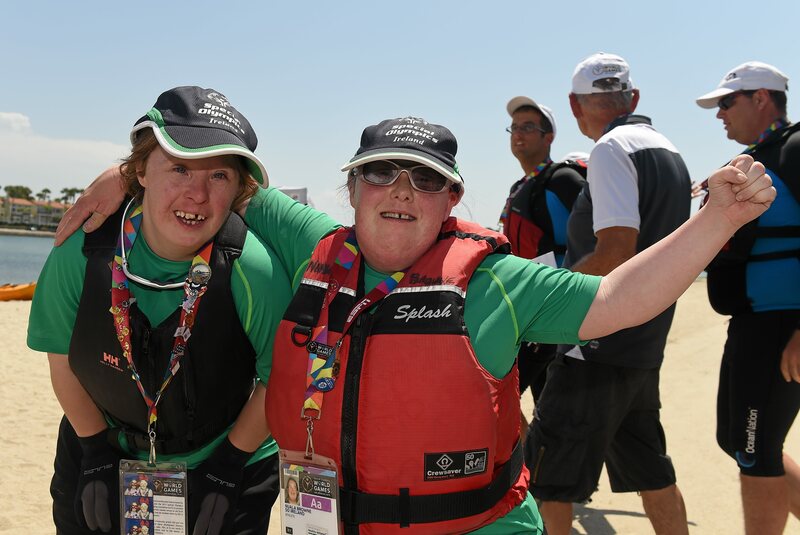 Working with Special Olympics Ireland in the Ulster region at MCE Public Relations over the last four years, I have seen first-hand the incredibly positive impact this charity has and World Games is just a small part of what Special Olympics does. In Ulster alone, 85 clubs provide life-changing sports opportunities to over 2,000 athletes with intellectual disabilities on a year-round basis, supported by a network of almost 6,000 volunteers and over 970 coaches. 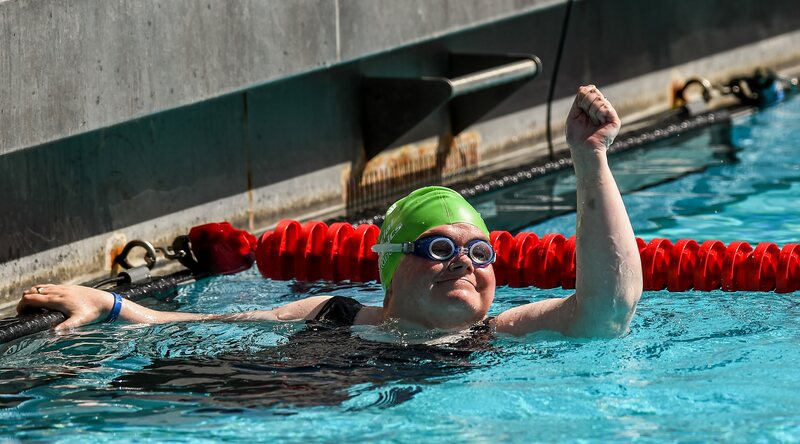 Not all of these athletes get the chance to compete on a world stage but each and every one of them benefits from inclusion in the Special Olympics family – a community that celebrates their individual abilities and helps to build vital social skills in a world where they aren’t always understood. As volunteers we started out as 155 strangers. By the end of our 10 days in LA, lasting friendships have been formed with people from every corner of the island. It’s an unbreakable bond that was developed through our collective Special Olympics World Games journey – the most incredible, inspiring, joyous and ultimately indescribable experience. Watching each of our athletes strive to do their best, we had the privileged position of watching them as they became heroes right in front of our eyes. It was intense, exhausting and often emotional but absolutely incredible and unforgettable. A week on since leaving Los Angeles, I still feel myself welling up, as well as an immense sense of pride when I see the impact the 2015 World Games has had. 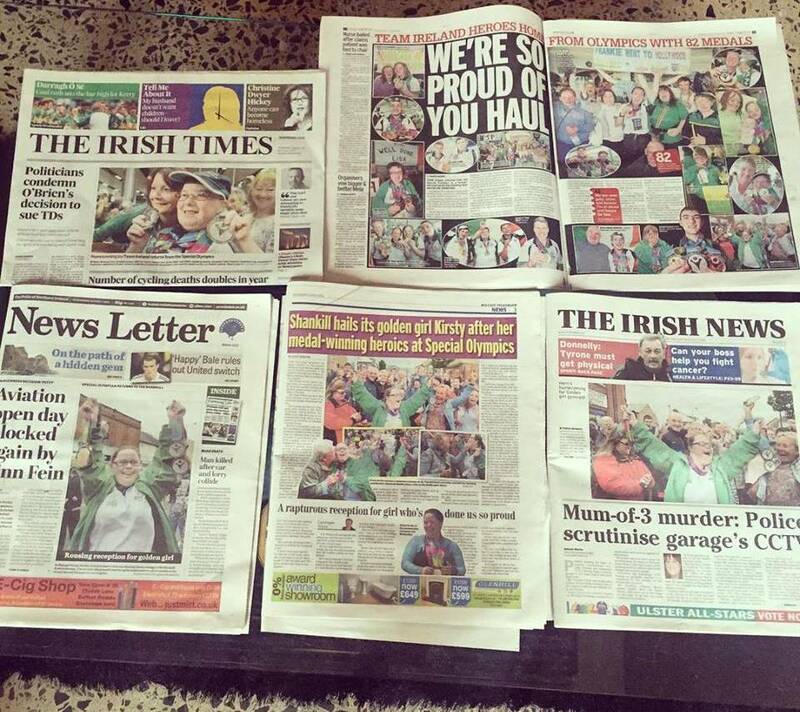 The incredible media coverage and support back home means so much to Team Ireland athletes, their families, friends, communities, clubs, volunteers and even complete strangers. 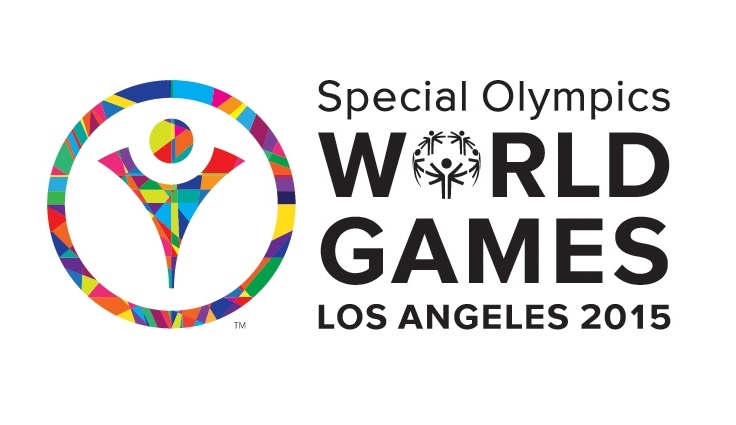 In a taxi in Belfast this week, the driver – totally unprompted and without knowing I was a volunteer – asked me if I’d heard how well our Special Olympians did out in LA. That about sums it up; Team Ireland’s success has impacted us all and is a reminder that when we celebrate ability, rather than focusing on disability, we level the playing field. I hope that the legacy of these Games will be that long after the celebrations settle down, people that have been inspired by Team Ireland’s incredible success at LA2015 will be driven to support Special Olympics in the future. A MASSIVE final thank you to everyone that contributed to my fundraising efforts, helping me to take up my position as a Team Ireland volunteer at LA2015. It was a once in a lifetime experience; this post only really scratches the surface. I couldn’t have done it without you and your support means the world. Thank you. COUNTDOWN TO #LA2015 IS ON! There’s something about the beginning of June that signals bedlam. Every single year. Anyone that works in PR and marketing will know what I’m talking about and will sympathise, with singed fingers from furious typing. We work in a business of peaks and troughs and this, folks, is most definitely one of the peaks. It’s probably something to do with that wrapping up for summer mentality that seems to dominate most businesses. Every year, our clients (wonderful that they are), rush to get the lion’s share of their news out in the four weeks leading up to 1st July. It’s bonkers but brilliant fun – there’s never a dull moment at this time of year, that’s for sure. But while everyone else is dreaming of winding down for the summer, I’m beginning to think about ramping up, for a very special project. I’m privileged to be joining Team Ireland as a volunteer at the Special Olympics World Summer Games in Los Angeles in July and August. Having worked with Special Olympics Ireland and Special Olympics Ulster for four years, it’s amazing to be able to give some extra and much-needed support to this great charity in what is a very important year for its athletes. Some 88 athletes – including 12 from the Ulster region – will travel to compete on a world stage at LA2015. 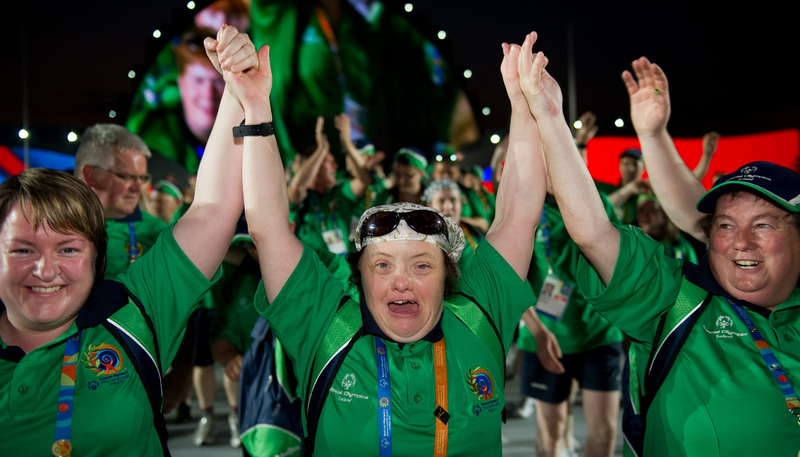 The athletes, who have many different intellectual disabilities, have trained for years for this opportunity, supported by Special Olympics Ireland, its coaches and volunteers. With the full support of my MCE colleagues, I’ve raised over €5,200 since December to secure my place as a Team Ireland volunteer. It’s been a hell of a challenge but one that the whole team took on with great gusto. From bake sales to pub quizzes, Easter treats and even a marathon, it was a massive team effort and I’ve been blown away by the support of friends, family, clients, colleagues and complete strangers over the last six months. Working as part of the media team, I will help to tell the story of the inspiring Team Ireland athletes, coaches and volunteers, live from the media centre in Los Angeles. It’s a once in a lifetime opportunity and one that I’m starting to get very excited about, now that it’s drawing closer. 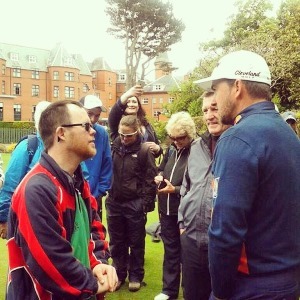 Last weekend saw the culmination of one piece of work we’ve been plotting for a number of months now, with Special Olympics Ireland and The European Tour as part of the build up to the World Games. The Team Ireland golf team were invited as VIP guests of The European at The Dubai Duty Free Irish Open hosted by the Rory Foundation. Getting the opportunity to watch their heroes in action was a dream come true for this group of inspirational athletes and a fantastic boost to their preparations for LA2015. Jill Connery (aged 29 from Scarva Co. Armagh) and playing partner, Ursula McDonnell (aged 70 from Co. Antrim); Paul Kirrane (aged 29 from Ennis, Co. Clare) and playing partner, Patrick Rutherford (aged 72, from Co. Clare); Rosemary O’Reilly (aged 29 from Co. Meath); Margaret Carr (aged 54 from Calry, Co. Sligo) and Leo O’Brien (aged 19 from Rathdrum, Co. Wicklow) enjoyed an action packed day of golf and star-spotting. It was absolutely wonderful (and often emotional) watching the athletes as they soaked up the atmosphere at Royal County Down. 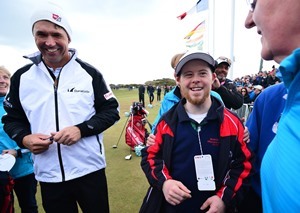 Starting off the day on a high, Special Olympics Global Ambassador, Padraig Harrington took time out to meet the athletes ahead of teeing off, providing valuable tips to the team, who travelled from right across Ireland. Since becoming a Special Olympics Global Ambassador in May 2010, Harrington has generously donated his time and expertise to the Special Olympics movement across the world by conducting golf clinics for athletes and coaches. And, in the biggest surprise of the day, the athletes were put through their paces by Northern Irish golfing great, Graeme McDowell in a putting competition. It really was a magic day. The generosity and kindness of The European Tour and the professional golfers was so heartening and its impact was profound. These athletes will now continue their preparations for LA2015, feeling the support and friendship of some of the world’s best golfers. To find out more about how you can support Team Ireland, check out the great Support an Athlete campaign, or call John Kivlahan at Special Olympics Ulster 028 9023 9023. Keep an eye on the hashtag, #LA2015, @SOIreland and @SO_Ulster on twitter for more World Games updates. Next year, I am taking on a very special challenge. I’ve had the pleasure of working with Special Olympics Ireland, and in particular, Special Olympics Ulster – one of its five regional programmes – over the last four years. During this time, I have met so many wonderful and truly inspirational people that have forever changed my outlook on life. Special Olympics athletes have proven to me time and time again that having an intellectual disability does not stop you from achieving great things; nor does it limit your ability to push your boundaries and strive to do your very best. The coaches and volunteers have also been a great source of inspiration – a group of truly wonderful people that give huge personal commitment to help Special Olympics athletes right across Ireland achieve their goals. It’s been hugely humbling to watch. In June 2014, I joined volunteers from across Ireland in supporting athletes at the Special Olympics Ireland Limerick Games. Working as part of the media team, I helped to tell the stories of athletes, families and volunteers to press across the island. It was a small but significant role and one that I greatly enjoyed. Team Ireland athletes at the Special Olympics World Summer Games in Athens, 2011. 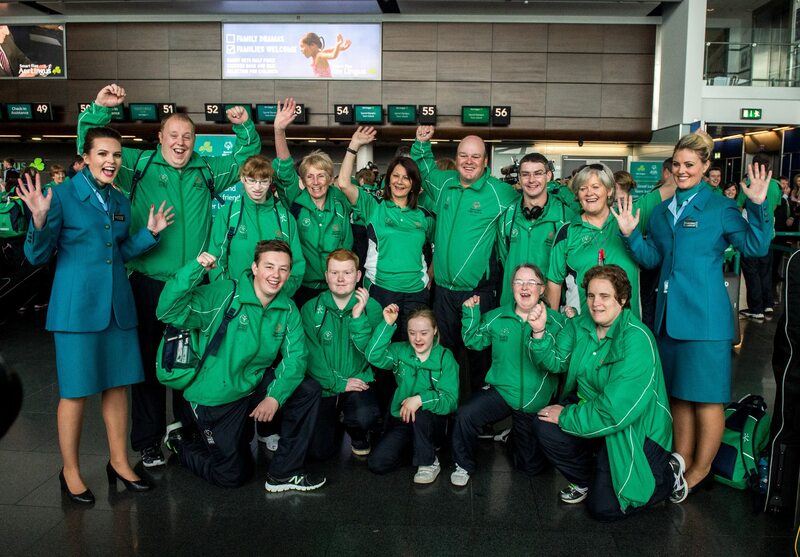 Next year, local Special Olympics athletes from right across Ireland will travel to the states to take part in the Special Olympics World Summer Games, Los Angeles 2015. And I’m honoured to be joining them once again as a volunteer. 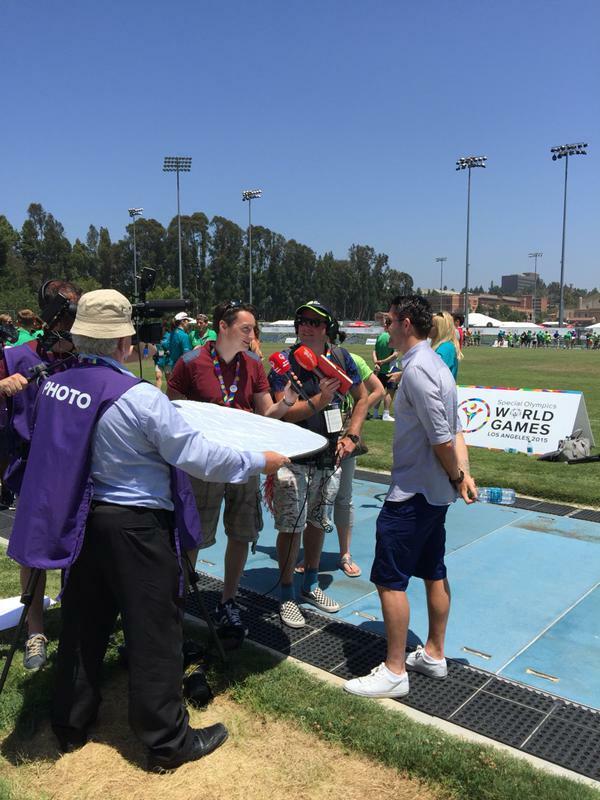 With the full support of MCE, I will join the Team Ireland media team at the Games in L.A. next summer. Whilst there, I will feed back stories to Irish and world media on our local athletes as they compete on a global stage, ensuring their efforts get the attention they so deserve. My road to L.A 2015 starts now, as in order to take my place as a volunteer and to fulfill my pledge to support the Special Olympics Ireland programme, I must raise close to £4,000. Over the next five to six months, I will host lots of fundraising events to help me reach my fundraising goal. I’ll post more details about those here in due course. It’s a daunting challenge and there’s a lot of money to raise but I know it will be worth the effort in the long run, giving me the opportunity to do something that will be hugely personally rewarding and worthwhile. In addition to monetary donations, I will have a number of events in the New Year, which will all require ballots in aid of my fundraising efforts, so I will be so grateful for any donations of prizes that companies may be willing to offer. I’ll also be enlisting the help of friends, family & colleagues in various guises from sandwich & tea making to cake baking, pub quiz compering & DJing (as well as attending events), so do let me know if you’d like to/can get involved. And, if you have an idea for a fundraiser you could help me with, please get in touch. There’s no way I can do this on my own, so I would like to say a sincere thank you in advance to everyone that will help me on my road to LA 2015, to be part of this very special once in a lifetime event.